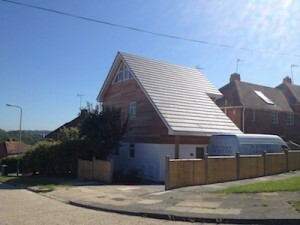 Congratulations to our client who has successfully completed the building of the timber framed Eco House in Coldean that we have been working on for the last several years. From the original concept of this eco-house right through to the final certification in Code for Sustainable Homes this has truly been a long, involved, complicated, frustrating but ultimately successful process. The house was originally conceived in 2006 as a low carbon home, then the Code was introduced and the target became a zero carbon code 6 home. This required some rethinking, to innovate integration of various low and zero carbon techniques and technologies, for e.g. Hemcrete walls (a hemp and limecrete walling solution with excellent U values from www.limetechnology.co.uk) and a Lohberger wood pellet stove (www.lohberger.co.uk) – and all of this in a changing construction landscape and some of the toughest economic times in history. Ultimately the site was sold to a developer and the aspiration for a Code 6 house was forgotten in an attempt to make the finances of the project work out. In the end the developer retained our original designs and built the house to comply with the planning condition that the house achieve CSH Code 3.